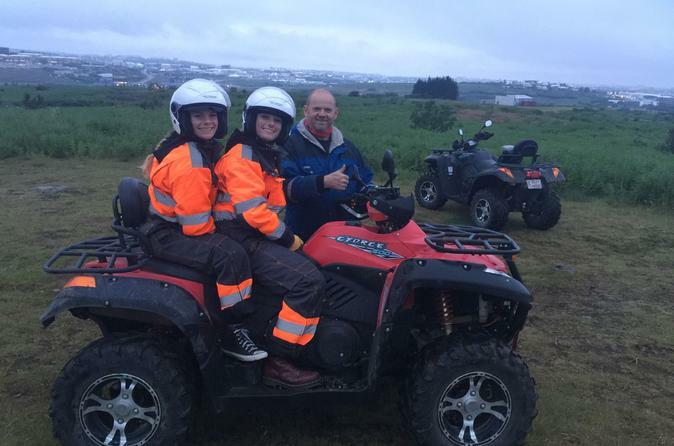 Ride an ATV through Iceland's scenic natural landscape under the midnight sun during this 3-hour evening tour from Reykjavik. Follow your adventure guide up Hafrafell mountain to get views of Reykjavik, Mosfellsbær and other towns from high in the hills. Revel in the extra hours of daylight provided by the midnight sun and the novelty of setting out on an outdoor activity so late in the evening. Learn about the region's ecology, flora and fauna from your local guide as you ride.  Bring your camera for fantastic photo ops. All safety gear and round-trip transportation from Reykjavik hotels are included. This was the most amazing experience! I would highly recommend to anyone traveling to the Reykjavik area. Luckily, we ended up having a private tour, and our tour guide was fantastic. Even though it was rainy and foggy at the time that we went, driving the ATVs around the lake and up the mountain was such a fun experience. The ATV tour guides were very friendly and helpful. It was just me and 3 kids and they accommodated that nicely. The tour was beautiful, even in not so great weather. I would highly recommend this company and tour. We took this tour in June and it was great! We had perfect weather. Just beautiful! Definitely recommend! Only downfall was it was foggy and rainy the night we went. The tour was fun driving up a mountain!! This was AMAZING! Best part of our trip to Iceland! The weather was amazing and so was our tour guide. Riding the ATV up the mountain was incredible and the views of the sunset were so wonderful. Even though it was too foggy to see the view at the top and a bit rainy, we had a blast splashing through water and viewing the scenery. Though it's late at night, it's completely light out and Kristjan took us to a lower hill with a view of our cruise ship. There we could see the Midnight Sun and the spectacular view of a capital city with so much open land and beauty. It was so fun and amazing! Loved the ATV ride to the top of the mountain. We had a clear day so the view of the sunset was lovely. However, there are 2 items on this trip that are mis-represented - 1 there are no refreshments provided at the top of the mountain and 2 it's a midnight sun ATV but we were actually back in our hotel by 11:15pm so we ended up seeing the midnight sun from our hotel room. It was just the 4 of us on this tour which was nice but we felt it was too short. It was supposed to last till 12:30am. 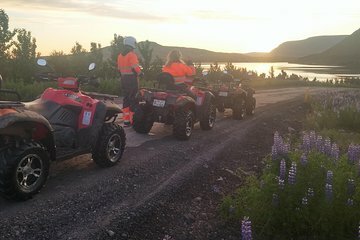 Our midnight sun ATV ride was the highlight of our trip!! Christian was our tour guide and as a local he was very knowledgeable. We rode the ATVs up a mountain to watch the breathtaking sunset and took a couple stops along to way to take pictures and enjoy the surroundings. Worth every penny!! This tour was great! We we lucky and had a private tour. The views were amazing! Our guide was wonderful.